Slow Death by Rubber Duck - Awareness or Paranoia? You are here: Home / Book Reviews / Slow Death by Rubber Duck – Awareness or Paranoia? Slow Death by Rubber Duck – Awareness or Paranoia? 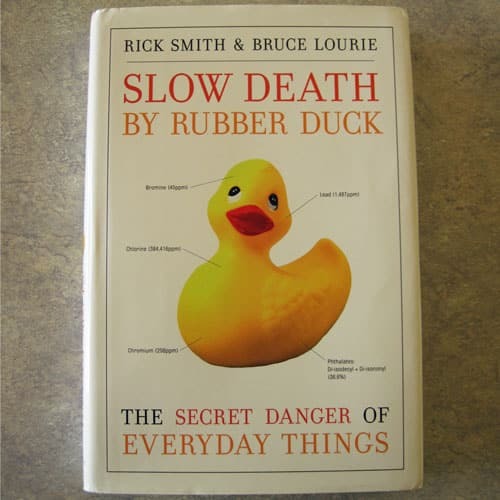 Slow Death by Rubber Duck: The Secret Danger of Everyday Things by Rick Smith and Bruce Lourie is a solid introduction to the pollutants lurking in commonly used items. The new wave of pollutants is hard to see, but can be just as dangerous (or even more dangerous) than the belching smokestacks and grime of days past. Endocrine disruptors such as BPA mimic the body's natural hormones, and can potentially cause harm even in small amounts. Very few companies have adopted the idea of “do no harm” – you must be your own advocate. The book opens with an extensive history of pollution and the efforts that have been made to clean it up, from Ancient Sumeria to the Broad Street Pump to the efforts that continue today. The authors then discuss how they deliberately first tried to clear their bodies of a particular pollutant, and then purposely exposed themselves to large amounts of that pollutant for a test period. Pollutants tested were phthalates, bisphenol A, triclosan, mercury, teflon (perflourinated compounds), bromated flame retardants (poly-brominated dephynyl ethers – PBDEs), and pesticides. Finally, they give suggestions for environmental advocacy actions that you can pursue in a section that they call “Detox”. The authors are intimately familiar with their subject area, and obviously passionate in their beliefs. For those who are not familiar with how widespread pollutants have become, this book will be a wake up call. With each substance examined, they demonstrate how much exposure is necessary to increase the levels of it in your blood, and how long it takes to get it out of your system, and potential health effects. During their test periods, only mercury produced significant, obvious health problems. The other materials, while a cause for concern, did not produce dramatic health changes with short term exposure. Seriously? The triclosan was in the garden hose to cut down on the slimy biomat that forms on wet surfaces, especially where water sits stagnant. Absolutely necessary? Nope. Completely pointless? Nope. At my old job back at the solar plant, we'd end up with huge snot-like tendrils of biomat hanging off some of the piping in summer, just from condensation. It was really gross. I felt that the over-the-top dramatics and self-congratulatory, somewhat smug tone that information was presented in at times weakened the fundamental message of the book, which is sound. I would have also like to have seen the “Detox” section address what you can do to detox your body and your environment in more detail. Advocacy is great, and needed, but we also need to clean up what's already out there. I've been working on some detox treatments myself using a detox deodorant. I've also been adding more greens to my diet. I felt the book No More Dirty Looks is a better resource for people to reduce the toxin load they're exposed to in their personal care products. I'm still looking for a better reference for other household items – mainly relying on common sense at this point. Glass and steel are less reactive than plastics and non-stick surfaces. Anything recently purchased that has that “new” smell is probably outgassing something like VOCS (volatile organic chemicals) or phthalates that you don't want to breath or expose yourself to in large amounts. Flaking and peeling coatings on things are also bad news. For home cleaning products, Frugally Sustainable offers many DIY recipes that are non-toxic and easy to make. Many of them can be found on her site, but she also has a new e-book available that includes additional recipes (see link below). In short, would I recommend this book at full price? No. Would I recommend it used or from the library? Yes, especially if you are not familiar with common pollutants.